The Tigers will get another shot at the Bulldogs. Waialua, the No. 2 seed in the Oahu Interscholastic Association White West, advanced to the semifinals with a resounding 59-47 win over Castle last night at McKinley Student Council Gym. The Bulldogs (7-5) meet McKinley, the top seed in the White East. In the late game, the Tigers advanced with a 63-36 victory over Waipahu. Waialua gave McKinley its only defeat during regular-season play. The semifinal matchup will be played at Campbell's gym today. Castle was another nemesis for the Bulldogs. Last year, the Knights eliminated Waialua from the playoffs. This season, on March 28, the Knights went to Waialua, fell behind 10-0, but rallied to stun the Bulldogs 43-32. Last night, Castle fell behind 9-0 and never recovered. Waialua senior Chelsea Ramirez scored 10 of her 17 points in the first half, while Kimberly Meyerowitz and Brittney Basilio did the blue-collar work under the boards. Meyerowitz finished with nine points and a game-high 10 rebounds, while Basilio had 10 points and nine caroms. Ashley Carillo added 10 points and five of her team's 19 steals. "Last time, we were too big-headed," Ramirez said of the early-season loss to Castle. "This game, we came out with intensity." Point guard Misty Maxwell was steady with seven points, six assists, four steals and no turnovers. Meyerowitz, who hustled to get four steals, said the Bulldogs did their homework. "Coach made us watch the video five times. It took an hour," she said of coach Michelle Sales. The studying worked. "We were lazy in that game." This time, Waialua was in control, though Castle pulled close twice. The Knights got within 16-15 before Waialua went on a 10-2 run late in the first half. Turnovers against Waialua's three-quarter press -- 12 in the first half -- halted each burst of momentum. Waialua's biggest lead was 29-18 shortly before halftime, but Castle made another run to start the third quarter. Kori Berinobis and Niki Kobashigawa drilled 3-pointers to spark an 11-4 run. After Ette Amerperosa drove to the bucket for a three-point play, Castle was within 33-31 midway through the third quarter. Basilio answered with six points in a row for the 'Dogs, and Castle got no closer than seven the rest of the way. 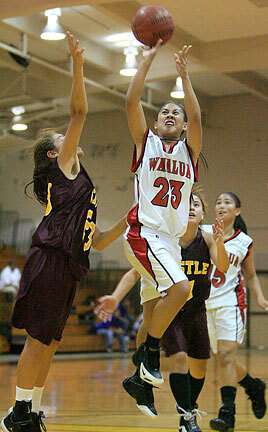 Waialua put the game out of reach with a 9-0 run midway through the fourth stanza and led 52-36 with 4:25 to play. "Last time, we handled their pressure pretty well," Castle coach Jeff McKeown said. "This time, we decided to dribble against the press. Good things don't happen when you do that." Kobashigawa led Castle (7-6) with 17 points, including 3-for-5 shooting from beyond the arc. Berinobis added 13 points and three steals. Amerperosa tallied nine points and nine boards, while center Sarah Phromisiri struggled with foul trouble and had only two points. Waialua got 18 assists on 20 field goals and committed just 13 turnovers. Castle finished with 25 turnovers and shot 29 percent from the field (17-for-58). CASTLE--Kori Berinobis 13, Candyce Ames 0, Niki Kobashigawa 17, Kelsea Berinobis 0, Sarah Phromisiri 2, Brandee Sasaki 0, Chevy Au-Stein 2, Leesha Domingo 4, Ette Amerperosa 9, Tati Dinson 0, Nicole Aberilla 0. WAIALUA--Klleirr Tuyay 4, Misty Maxwell 7, Salvie Alfanta 0, Kimberly Meyerowitz 9, Miki'ala Leslie 2, Chelsey Ramirez 17, Brittney Basilio 10, Ashley Carillo 10, Noe Dela Pena-Hoopai 0. 3-point goals--Castle 5 (Kobashigawa 3, Kori Berinobis 2), Waialua 4 (Ramirez 3, Maxwell). Pearly Togiai scored a career-high 27 points and hauled down eight rebounds as the Tigers cruised past the Marauders. Freshman Kylie Sato added 15 points and a game-high six steals for the swarming Tigers, who added 20 steals off their fullcourt press and halfcourt man-to-man defense. McKinley improved to 12-1 in league play (17-6 overall). Coach Bob Morikuni emptied his bench early. "Our outside shooting wasn't hot, but Pearly did a great job of providing that post," he said. Lilyan Donley led Waipahu (1-11), the fourth seed from the West, with 10 points and six rebounds. Demi Samson added seven points and had only two turnovers while facing McKinley's press. Tonight's semifinal winners earn automatic state berths. "Against Waialua, we're gonna have to play defense," Morikuni said. WAIPAHU--Lilyan Donley 10, Mahealani Spencer 2, Mercedes Kaleikini 1, Joyce Baptista 4, Amber Javier 2, Kelcy Viliamu 4, Ashley Bullard 0, Rashia Chatman 6, Demi Samson 7. McKINLEY--Jackie Tihano 0, Kaitlyn Ikehara 8, Chelsie Sato 6, Jaelynn Lopez 0, Pearly Togiai 27, Maribel Hebron 0, Kylie Sato 15, Sasha Hong 0, Jorina Faletoi 4, Crystal Tafai 1, Allyson Villanueva 2. 3-point goals--Waipahu 0, McKinley 4 (Ikehara 2, K. Sato 2). Four players scored in double figures as the Sabers steamrolled the Cougars. KAISER--Sarah Aila 2, Jessica Dusich 14, Tiare Kepa 9, Kristyn Mathenson 7, Mari Mathenson 6, Chelsea Okuma 16, Leandra Poole 2, Jewels Ross 0. CAMPBELL--Cheyna Tagura 9, Saphyre Eltagonde 2, Gabrielle Serrano 0, Valerie Quintana 2, Vai Confer 11, Aloha Dias-Kekahuna 11, Amber Kaulia 5, Shawny Veracruz 2, Oli Kila 17, Ipo Kila 2, Jenny Sweeney 15. 3-point goals--Kaiser 4 (Kepa, Mathensen, Okuma, Dusich), Campbell 0. Ashley Jacobs shot 4-for-7 from 3-point territory to net 17 points and lead the Surfriders past the Seariders at Campbell. Zsalei Kamaka added 12 for Kailua. The Surfriders take on top White West seed Campbell today. WAIANAE--Danielle Lovell 12, Brittni Dinong 0, Chaelyn Manuel 2, Kahealani Kelii 2, Emma Atiga 1, Genevieve Cuesta 0, Ngaire Yuen 8, Afioga Tago 6, Melody Moe 4. KAILUA--Kristen Corrales 9, Tawny Kiko 3, Chelsea Babylon 3, Miki Scott 0, Tianna McKeague 0, Zsalei Kamaka 12, Pumehana Kanoa 0, Jarrish Mauhili-Kaneakua 0, Netia Ulugaono 4, Ka'u Kohatsu 0, Ashley Jacobs 17, Kahea Chang 3. 3-point goals--Waianae 3 (Yuen 2, Tago), Kailua 4 (Jacobs 4).